Independent coffee house St. Coffee on St. Claude resides on a bustling corridor in NOLA's Marigny neighborhood. Proprietors Jayna Jenson and Alex Schutz have been pulling proper espressos since May 2011, and it has become the local hangout. Jayna (who I first met years ago at a sissy bounce performance in a warehouse in Brooklyn) is a font of local wisdom — and always knows where the party's at. 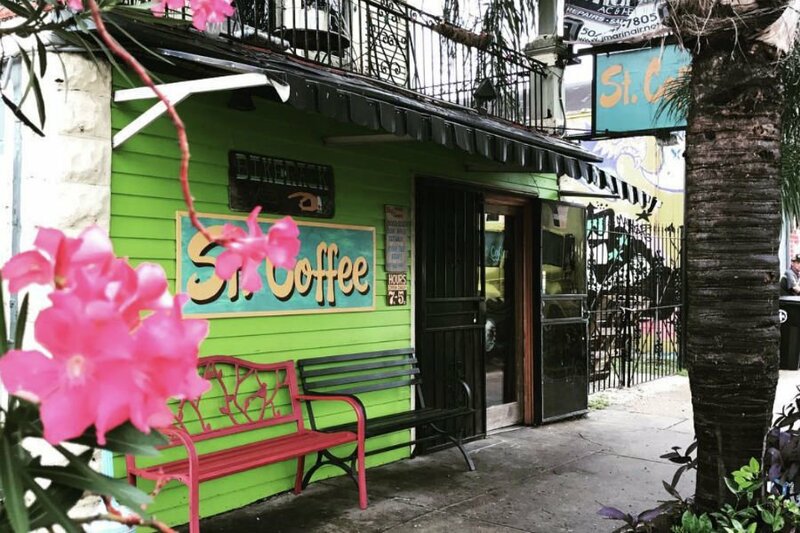 Tell us about your coffee shop: We feature confections from a number of local cottage industries within the Marigny, French Quarter, and Bywater neighborhoods of New Orleans: empanadas from Empanada Intifada, Meltdown popsicles (pineapple basil, sea salt cashew dark chocolate), Sugerman Bagels, Shake Sugary pastries, Alois J. Binders doughnuts, and savory bagel spreads from The Raddish! Bakery. Our coffee comes from Portland Roasting. We also like to feature local roasters like Try Me and Orleans Coffee Exchange. What's your caffeinated drink of choice? A strong cup of French press dark roast with a teaspoon of agave nectar and a splash of half-and-half is just about the most heavenly thing! What should we know about the neighborhood? St. Claude is a boulevard bustling with change. In our immediate neighborhood we have several useful and locally owned businesses: a bike shop (Gerken's), thrift store (San Claudio), hydroponics shop (Urban Organics), bodega (Hank's), and plant nursery (Harold's). And let's not forget Christ Temple Church. It's a busy little area, and rumor has it the City of New Orleans is slated to build a streetcar line later this year if federal funding is approved, which means big changes for our neighborhood. Where you go when you need inspiration? I love to drive out of Orleans Parish and into the country to clear my head and seek solitude. Bohemia, Vacherie, Gramercy — these are the lovely little towns outside the metro area. Gorgeous cypress trees, slow-moving riverboats, run-down juke joints, bizarre antique stores, and salt-of-the-earth people can be found in the lower parishes. Best spot for people-watching: Hank's Seafood across the street from the coffee shop. Hank's is somewhat of an institution, a place where you can buy tampons, pre-paid phones, liquor, laundry detergent, and pounds of crawfish all in one stop. It's open 24 hours a day, so there is no shortage of interesting foot traffic. With the prostitutes coming off their shifts, the drunks ambling around with cans of Steel Reserve, the gutterpunks begging for dollars — all mingling together in an absurd and hilariously entertaining social swirl — it has to be the best people watching ever. Your favorite spot for lunch: Cake Cafe on Chartres. Their Reuben sandwich is insane!! The route for your favorite city joy ride/stroll/drive: I love biking down Esplanade and out to City Park on a Sunday and strolling around the Besthoff Sculpture Garden. And then laying under a huge oak for a nap. Where do you go when you want to be in the middle of it all? Obviously, Jackson Square. I rarely get down there, but it's pretty epic. Tarot card readers, brass bands, horses, shoeshiners, hustlers, magic makers. It's a touristy spot for sure, but there are beautiful iron benches to sit down and rest in the middle of it all. Where do you go when you need an escape? There is an old library up on St. Charles Avenue called the Milton H. Latter Memorial Branch (5120 St. Charles Avenue). It opened in 1948 in a turn-of-the-century mansion once owned by silent film star Marguerite Clark. I'll go during their weekly book sales and find a cozy chair to sit in and look through old New Orleans photo books. The live oaks outside of the library are some of the most gorgeous in the city. Most underrated thing in your city: The reflexology clinic on Toulouse St. in the French Quarter. It's always empty! I don't get it. I go see the Korean family that owns the place at least once a week. They do a 45-minute session for 50 bucks, which includes a detoxifying footbath in a tea full of Chinese herbs, and a foot massage that will send you into the deepest state of relaxation. Especially good after a long weekend of partying. Most overrated thing in your city: Bourbon Street. No explanation needed. Favorite local shops? Gnome (1301 Decatur St.). You can pick up the latest issue of Hi-Fructose, jewelry from Mexico, messenger bags from NYC, and the owner is a sweetheart. Gnome shares space with The Iron Rail bookstore, another favorite. I love my neighborhood bike shop, too. Gerken's has awesome rides and accessories at bargain prices! I've been shopping a lot lately at the newly opened Maypop Herb Shop for soap, teas, and amazing herbalists that can answer any question. You dream about your meal at Three Muses on Frenchmen. I had the braised pork belly in a local Nola beer glaze on a sesame scallion pancake with apple chutney. The place is owned by a local singer named Sophie Lee and the place is always hopping. Favorite local icon/monument/institution? I love the St. Roch cemetery at the corner of St. Roch and Derbigny. There are so many beautiful cemeteries. This one is pretty unkempt, but inside the chapel the walls are covered with a bizarre collection of ancient prosthetics, crutches, anatomical plasters, crucifixes, and little thank-you bricks. Take a stroll afterward to the St. Roch Tavern for a cocktail, another local monument. The best thing about your neighborhood: Bacchanal, a small wine shop on Poland Avenue with a big backyard. You basically walk in and order a bottle of wine, then sit under the towering banana trees tippling and talking with friends. I find myself there at least once a week. Their wine selection is the best in the city. These days in New Orleans everybody's talking about our football team. The Saints are doing fairly well, so that's always a hot topic! Many of my pals have been talking about the closing of A.R.K., a longtime home to Plan B Bike Collective, The Iron Rail anarchist bookstore, and several artist studios, as well as a small arts non-profit called Hasbin Wilby's. Everyone was asked to move out and rumor has it that the space will be zoned commercially. Depressing, to say the least. Best book or movie or song based in your fair city? No writer has written more accurately about the people and goings-on of New Orleans than John Kennedy Toole in A Confederacy of Dunces. Novelist Poppy Z. Brite's stories about the city are also fantastic. Best way to pass an evening: Checking out a show at the new Siberia nightclub (Elysian Fields, at St. Claude), which features a healthy rotation of metal, New Orleans bounce, rock, and everything in between. Siberia keeps it real! Taxidermied turkeys, elkhorn chandeliers, a painted snowy ice god mural, plus slamming stiff drinks made by fantastic bartenders. You may end up surpassing the evening and partying on till dawn. What are you looking forward to? The lack of humidity. We suffer through months of non-stop stifling heat and then the fall comes to enchant us with its slight breeze. No trip to New Orleans is complete without attending a secondline, it's known as the quintessential New Orleans art form. Parade through the Tremé, dancing behind the most epic brass street music you've ever heard. Our city is full of beautiful traditions, but this particular party is the most loved! Is there anything else you'd like to share with FATHOM readers? New Orleans awaits you! In the meantime, stream WWOZ (our local radio station) and drink a glass of bourbon under the full moon, and you'll feel like you are here with us. See the locations mentioned in this story (Googlemaps).